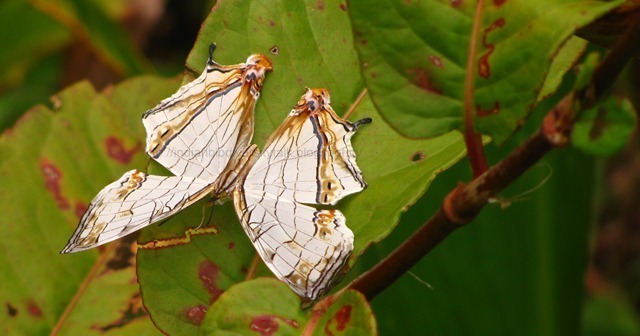 A first of its kind survey of the butterfly fauna at the Garo Hills in the North Eastern Indian state of Meghalaya which is part of the globally recognized Indo-Myanmar biodiversity hotspot has reported 298 species of butterflies among which 8 are very rare and are legally protected due to the steeply falling population status. The research team which has conducted the study assumes that the original butterfly species richness of Garo Hills can be 600 to 650. The study which was conducted during 2008 to 2010 to study the butterfly species richness in pre-monsoon and post-monsoon periods, has also reported range extensions for two important butterfly species - Elymnias peali or Brahmaputra Palmfly and Prothoe franck regalis or Regal Blue Begum. Brahmaputra Palmfly has so far been reported from Upper Assam and from Namdapha National Park in Arunachal Pradesh only. Regal Blue Begum similarly was reported from Upper Assam and Manipur in India and also from Northern Myanmar. Both of these butterflies are very rare and are protected under the Schedule I of the Wildlife (Protection) Act of 1972. So the new records increase the conservation significance of Garo Hills. The study also points out that jhum cultivation, plantations, illegal coal mining, and the proposed uranium mining is threatening Garo Hills, despite it being the last strong hold of biodiversity in the area. It calls for immediate action to conserve riparian forest patches and the large tracts of evergreen forests to conserve the butterfly faun here. According to Krushnamegh Kunte, who led the survey, the area is very much notable for endemism at subspecies level which again makes it very important in the conservation perspective. The study which is published in a special additional issue of the Journal of Threatened Taxa also includes the first annotated checklist if butterflies of the Garo Hills.